Monday, April 8: Ronald McDonald House, New Brunswick, N.J., 4 – 6 p.m.
Tuesday, April 9: Ronald McDonald House, Chestnut Street, Philadelphia, 5 – 7:30 p.m.
Tuesday, April 9: Cradles to Crayons, onsite at Independence headquarters, 11:30 a.m. – 1:30 p.m.
Wednesday, April 10: Support Center for Child Advocates’ Benefit Reception, The Crystal Tea Room, Philadelphia, 5 – 8 p.m.
Thursday, April 11: Philly Reads Executive Storytelling, onsite at Independence headquarters, 12 – 1 p.m.
Saturday, April 13: Share Food Program, Philadelphia, 9 a.m. – 12 p.m.
Saturday, April 13: Leukemia & Lymphoma Society’s Big Climb Philly, 9 a.m. – 1 p.m.
For the third straight year, Blue Crew volunteer participation reached an all-time high in 2018. 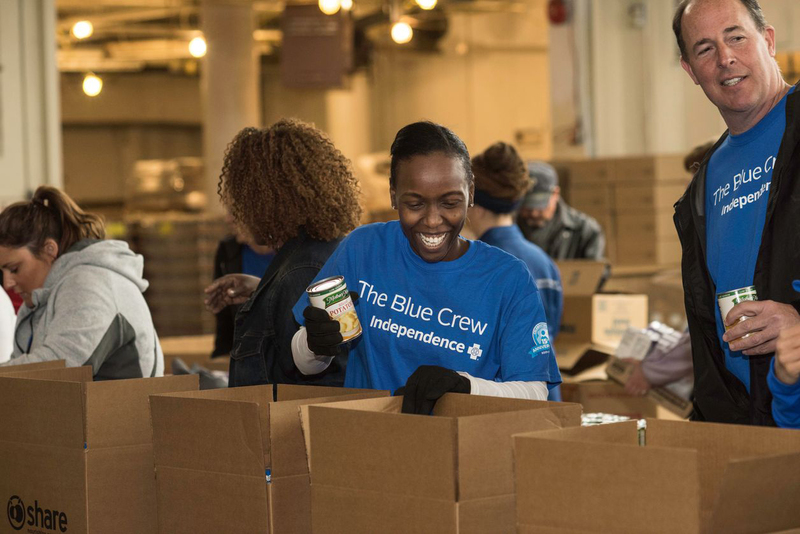 In the past year, over 1,800 Blue Crew volunteers donated more than 15,000 hours in support of 105 nonprofit organizations in our region. In total, the Blue Crew participated in more than 350 different service projects. The value of volunteer time contributed is equivalent to $371,000, according to The Independent Sector, a coalition of nonprofits, foundations, and corporate giving program. From 2017 to 2018, Blue Crew volunteer participation increased 31 percent. Since 2015, volunteer participation has increased by 95 percent. Independence Blue Cross is the leading health insurance organization in southeastern Pennsylvania. With our affiliates, we serve 8 million people nationwide. For more than 80 years, we have been enhancing the health and well-being of the people and communities we serve by delivering innovative and competitively priced health care products and services; pioneering new ways to reward doctors, hospitals, and other health care professionals for coordinated, quality care; and supporting programs and events that promote wellness. To learn more, visit www.ibx.com. Connect with us on Facebook and on Twitter. Independence Blue Cross is an independent licensee of the Blue Cross and Blue Shield Association.